There are lots of trends and buzzwords when it comes to wine, many of which can be confusing to those who are unfamiliar with the terminology. One trend that we are seeing more of in the wine world is an interest in natural, organic and biodynamic wines. What do these labels mean and what’s the difference between these wines? Let’s try to decode this a bit. Organic wine is made of grapes grown without the use of pesticides, herbicides, fungicides or synthetic fertilizers. 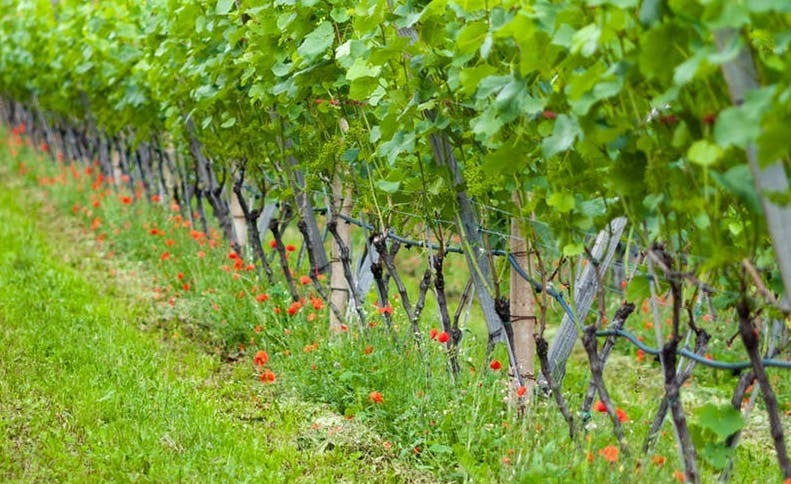 In the vineyard, bugs, weeds and other pests are managed using natural substances or removed by hand. Fertilizers include things like compost, compost teas, green manure and cover crops. In terms of winemaking, wines are made without any chemical or synthetic products and are generally not manipulated by processes such as reverse osmosis or excessive filtration. The use of cultivated yeast or egg whites (for clarification) is allowed, but the use of sulphites (an agent used to help preserve wine) is still unresolved. In the US, organic wine cannot contain added sulphites; in Europe and Canada the addition of a small amount of sulphites is allowed. As explained by Southbrook Vineyards, a biodynamic winery in Niagara: “biodynamics emphasizes the balance and interrelationship of a farm’s soil, plants and animals to grow low-impact, vibrant crops, including grapes. It treats the whole farm as a single living entity.” In addition to not using any chemicals or pesticides, biodynamic farming also uses specially prepared composts, the addition of ingredients such as herbal teas, and the orientation of the moon and stars to help determine when to plant, plough, treat and harvest. People who follow biodynamics also believe the moon has an impact on how your wine tastes, as illustrated in the image below. The best days to drink your wine are fruit and flower days, when the wine will be most expressive and open. With natural wines, the grapes are farmed organically or biodynamically, but once in the winery, there is very little intervention. Grapes are crushed but not pressed and only wild or ambient (no cultivated or commercial) yeasts are used for fermentation. There is often no filtration or fining to remove any particles or sediment and no sulphur or sulphites are used to help stabilize the wines. Essentially, the grape juice is left to make itself into wine, resulting is a very natural product. While there are certifications for organic and biodynamic wines, there is nothing yet for natural wines; most natural producers will follow the above guidelines but often with variations. Many people believe that organic and biodynamic wines taste better—just as with organic produce, often these wines are fresher, brighter and more complex. Natural wines can have a distinct raw and rustic flavour that is not for everyone, but there is certainly complexity and honesty in these wines. As with all wine it is ultimately about your personal preference, but it is always good to explore outside your comfort zone. Look for one of these the next time you are buying wine and enjoy!